Today’s freight transportation environment is covering more miles and using more fuel with a shrinking number of drivers and vehicles. Truck sales have also seen a decline in recent years, with manufacturers expected to sell less medium and heavy commercial trucks by 2026. Experts predict that freight tonnage is expected to grow by 35% between 2016 and 2027. One of the reasons is that consumers are spending more time online, buying everything from retail items to groceries. Literally anything can be delivered by freight. 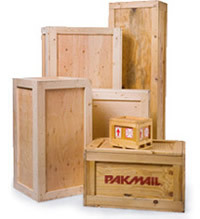 Here at Pak Mail of Jonesboro we provide various shipping solutions for a wide range of needs, including custom crating and freight shipping. This growing trend in e-commerce is shifting the need from retail space to more demand for distribution and fulfillment centers. The Transportation Planning Board remarks that each person in the United States generates demand for more than 60 tons of freight per year, which is mostly made up of consumer goods. This has led to freight being delivered by smaller UPS, FedEx or USPS delivery trucks, rather than big tractor trailers. Therefore, companies like FedEx have to ensure their drivers uphold high standards and try their best to deliver the packages quickly and safely. FedEx Ground driver James notes on Mental Floss that drivers have an incentive to make sure your packages are safely delivered, as they sometimes get bonuses. They are also trained to notice if thieves are following their vehicles when they make package drops. James went onto state that this is why drivers will not leave packages behind if the neighborhood seems unsafe, and will go out of their way to keep your package secure. Drivers often also have to deal with dogs and other pets, and while some brave the backyard to deliver your package, others will not if dogs are loose. UPS driver Keith Greenleaf has been with the company for more than 25 years delivering in the D.C. area. While several years ago the 56-year-old was mainly delivering to retail and commercial locations, these days more than half of his deliveries are residential. The lack of available parking and congestion has become so unworkable that Greenleaf has little choice than to walk a good portion of his route to safely deliver packages by hand. The situation is exacerbated all over the country with overworked drivers and an ageing workforce. In order to maintain their standards, therefore, and ensure a stable supply chain to allow freight to be delivered in a safe and efficient manner, many companies are digitizing their fleets. Deloitte remarks in a study titled ‘The Future of Freight’ that telematics sales are forecasted to grow 16% per year for the next decade, along with the ability to track, record and coach driver behavior. This kind of technology has already been implemented through systems such as the Electronic Logging Devices (ELDs), which have now been mandated into law in the U.S. for commercial vehicles. Verizon Connect details how the ELD Mandate monitors drivers to help companies stay compliant with government regulations, as well as using advanced telematics to improve delivery times by analyzing vehicle status and driver behavior. Systems like the ELD also ensure drivers are working the legal number of hours and are getting the required rest. Overdriving to meet company targets is a big cause of accidents involving freight vehicles. With growing traffic and congestion, freight drivers have had to adjust and adapt to the new landscape. UPS for example, has introduced its first eBike delivery vehicle in Portland, Oregon, in an effort to reduce emissions and take advantage of curb space to deliver packages. Not only are their vehicles sustainable, but drivers are getting exercise while delivering your packages. Other companies have also taken to using digitization and tracking technology to ensure that they maintain consumers’ wishes for faster and cheaper deliveries, as well as stay compliant with government regulations to maintain a healthy workforce. Despite these advances in technology, freight drivers are still struggling to keep up with the ever-growing demand. This entry was posted on Tuesday, July 17th, 2018 at 7:16 pm and is filed under Shipping. You can follow any responses to this entry through the RSS 2.0 feed.